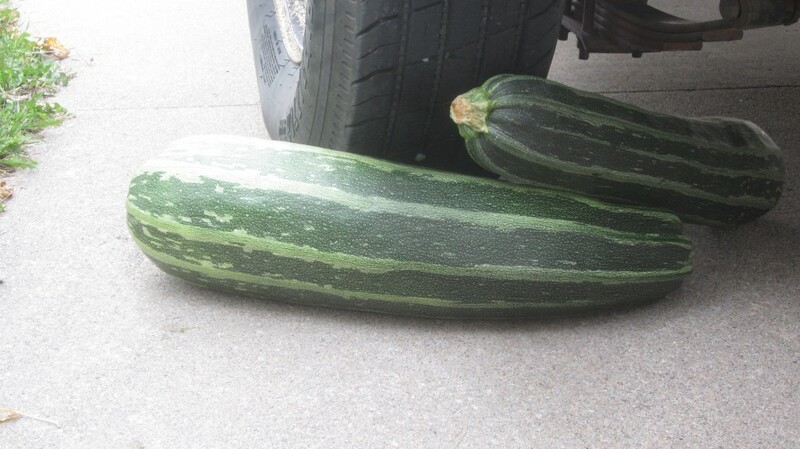 It’s such an old joke in these parts that it has become a cliche: the only time we lock our car doors around here is during High Zucchini season–to prevent our neighbors from sharing their surplus zucchini with us. If you grow zucchini, you know why this old saw is funny: a single happy zucchini plant can be an overeager producer, putting out many more of the squash than is easy to keep up with. When the squash are small(ish) they are tender and are a succulent addition to soups or stews or stir-fries. But woe to you if you forget to check your plants for a day or two, or have to go out of town for the weekend. Zucchinis are like commercially-raised hogs, in that they just don’t stop growing. They just get bigger and bigger and BIGGER, in a very short span of time, too, until they are no longer so succulent or tender. Until you can barely lift them. So what can one do with one of these behemoths, you may be wondering? A stout zucchini makes a great (news) paper-weight. Because of mountain lion sightings in our area, we’ve learned to grab some sort of stout weapon whenever we go out to shut the chickens in after dark. Usually there’s a pitchfork or a shovel on the back porch and I’ll grab one of them and have fantasies about fending the neighborhood lion off all the way out to the coop. If suddenly one day this blog goes black and you never hear another word from me, you’ll know that I finally met that mountain lion in the dark, and the pitchfork didn’t cut it. But I really don’t think that’s going to happen. Not with little Mack looking after me. One day little Mack–my little man who dearly hates it when I go out there in the dark by myself and usually goes with me–was sick and so couldn’t go with me. He handed me a very large wrench. “Here, Mom, against the mountain lions,” he said. I looked down at the wrench. “A wrench?” I asked him. But anyway, I’m off-point (and that never happens, right??). One night I stepped out on the back porch and there was no pitchfork or shovel or even a powerful wrench to be seen. I cast my eyes about until they landed on . . . a pile of very big zucchinis. Perfect. Weapon. As tough as the wrench, heavier than the shovel, and I’ll tell you this: I certainly wouldn’t want to be hit in the head with one. I’m sure the mountain lions in the area feel the same way. Pshaw. 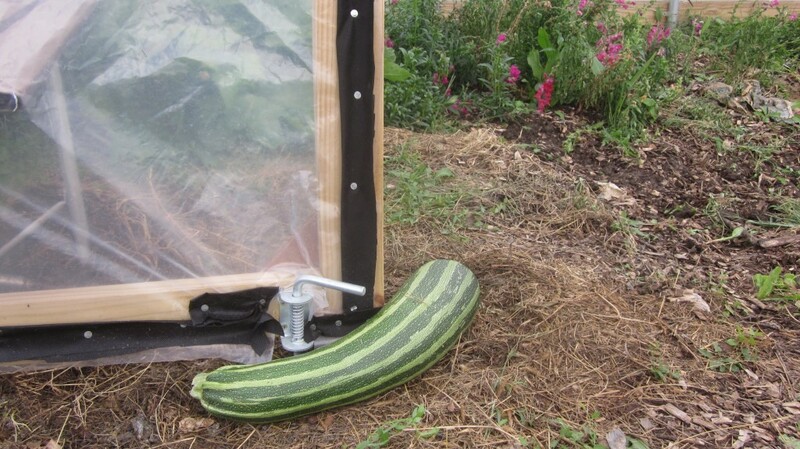 A large zucchini makes a great doorstop out at the hoop house. Anyway. If you don’t let your zucchinis get too big (if you can’t pierce the squash’s skin with your fingernail, and neither can you cut it with a knife, and it you can’t carry it to the house because it’s too heavy, then it’s too big) then they are great shredded up and made into zucchini bread. I’ve always liked zucchini bread. So what’s the problem? I’ve LIKED it, Gentle Reader. In a mild way. But I’ve never loved it. Not with a passion that would spur me on to go to the trouble to shred and freeze enough for several batches, that is. Zucchini bread is, I’ll grant, moist and tasty and an excellent depository for neglected zucchinis. But if you’re only mildly interested in zucchini bread, and when matters–such as husbands and a goose and grandchildren and children who all need regular feeding–converge to keep you from harvesting your zucchini squash when they are small, you may end up pushing a wheelbarrow full of bloated baseball bat-sized squashes to the house, wondering if you should just pause at the chicken yard and toss them to the chickens immediately and save yourself some time and bother–well . . . perhaps you should reconsider for a moment. 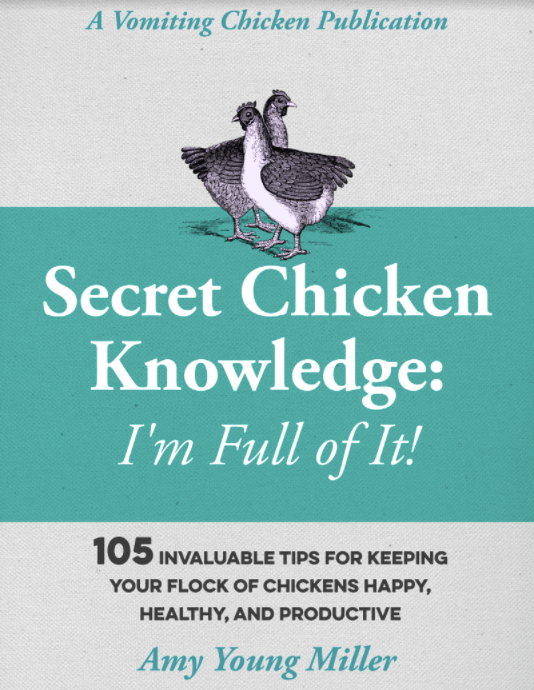 Because I’ve got the recipe for you. After all, if you’re going to shred up enough zukes to sock away in your freezer, enough for several batches because you’re in that kind of a mood (where even the housecat is watching you carefully, afraid, perhaps, that you might just obey a whim and throw her into the juicer or sock her away, grated, in the freezer for winter-time eating) and it’s October and harvest time and so forth. A pile of big zukes can be a very effective wedge to keep the trailer from rolling away. This was my thought: if I can come up with a zucchini bread that I will really LOVE, then it will be worth my time to grate and toss into freezer bags enough grated zucchini to make many batches of this bread over the course of the winter. In fact, I’ll feel very clever about it, it being harvest and stocking-up-time and October and whatnot. Anyway. I monkeyed about with my old zucchini bread recipe, making in into a totally new zucchini bread recipe, and I love it. I love it. I love it. Typical zucchini bread is bland, to my tastes. 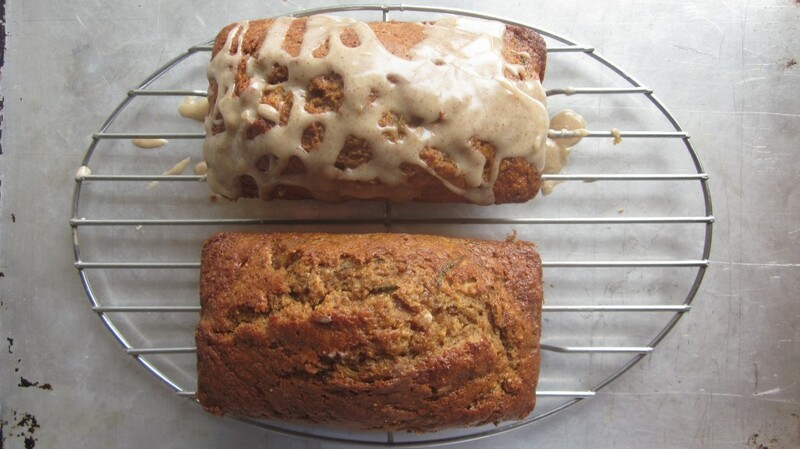 So this week, as I thought about those big zucchinis and how to make a better zucchini bread, this one thing kept popping into my mind: ginger. Candied ginger, in fact. Then I mixed up a batch of zucchini bread, and I added candied ginger, chopped very very fine, to the zucchini batter, along with a few more toothsome spices, and (to top it off!) I made a wonderfully spicy icing to dribble on the top. Then I ate a slice. Oh, baby. Then, I ate another. Heavens to Betsy. I did it. I made a recipe for zucchini bread that absolutely shot my socks off. And, by the appearance of the several decimated loaves out on the bread board ten minutes later, it also impressed my family. Yay, me! And yay, you, because here’s the recipe for you to try! What do you do when your mild-mannered zucchini plants turns out squash big enough to fend off a wild animal? 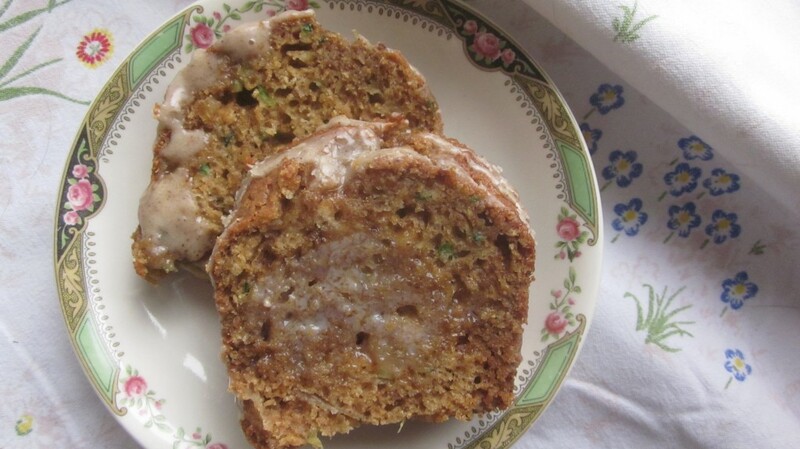 Why, you grind it up and make bread, silly, the very best zucchini bread you've ever eaten! Preheat your oven to 325 degrees F (165 degrees C). Spray 2 9x5-inch loaf pans with cooking spray and line with parchment cut to fit the bottom of the pans. In a large bowl, mix together the brown sugar, molasses or honey, vegetable oil, milk and eggs until thoroughly combined. Stir in the cinnamon, ginger, nutmeg, cloves, candied ginger, baking soda, baking powder, and salt. Gently mix in the shredded zucchini, and stir in the flour, until just-moist. Pour the batter into the prepared loaf pans, to ½" from the tops of the pans. Bake in the preheated oven until the loaves are browned and springy to the touch, 50 to 60 minutes. A toothpick inserted into the center of a loaf should come out clean. Allow to cool in pans for about 10 minutes before removing to finish cooling on racks. Mix confectioner's icing, spices and table cream to make a creamy icing, and dribble over the top of the loaves, if desired. Sop up the extra icing on your finger and place in your mouth. You've worked hard. You deserve this bit of delight. A skiff of butter on the warm bread won’t go amiss, either . 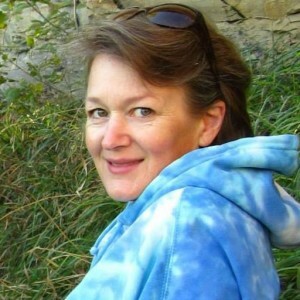 . .
I’ll be sharing this post with The Prairie Homestead and Frugally Sustainable because I like mixing with all those folks. Come on over and join us! Marrows, okay, so that’s what they are! I’ve wondered! I got up this morning somewhat mildly upset, because I am out of ginger for my morning tea. I love ginger and I felt very bad because I have none on hand…Now I get to READ about a Zucchini Ginger Bread which I also don’t have. Is life crual or what. Your recipe looks wonderful but because I do not have the items required to make this, I must relay on you overnighting me a loaf. I will wait at the door. Okay, Chef William. I’m going to try my hand at raising my own ginger next summer (can’t wait!!) so then I’ll have plenty to share, and you’ll never–run-out-of-ginger-AGAIN! Me too, Sophie! Very comforting cold-weather bread! LOL your pictures cracked me up. And I bet you could of done some damage to any mountain lion. But the recipe looks like the best things to do with those zukes. Try it! You’ll like it, Maryann! Pinned, because High Zucchini season is over for us. (I love zucchini bread, by the way, especially if it has chocolate chips in it.) Why do you keep tempting me with these recipes? Now I have Still Another One for Next Year. P.S. you can leave zucchini on my doorstep anytime. 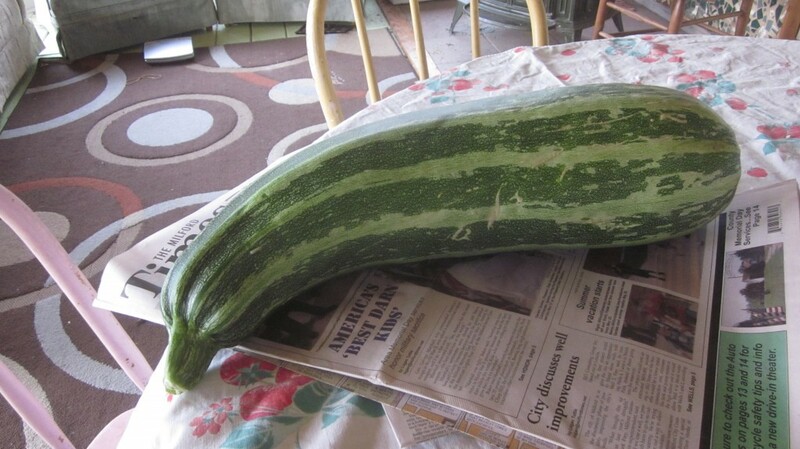 Well, there’s always next summer, to let your zucchinis get redonculously large! And I’ll keep that in mind, Alana–next time I’m in New York with a back seat full of big zucchinis (hey, it could happen!). Chocolate chips? Yum!! I have frozen grated zucchini in my freezer that needs to be used up. I think this is exactly what I need to do with it. Your blog name is awesome too. My husband found this last night diing Back to Eden reading and I was laughing so hard readingthis and other posts. I had a childood obsession with vomiting. I made this bread today, by the way! Haven’t tastedit yet. It’s going on our trip with us. I need to try this. My mil makes hers with chocolate chips. Thanks for a new recipe. Chocolate chips sounds like a good addition, too!